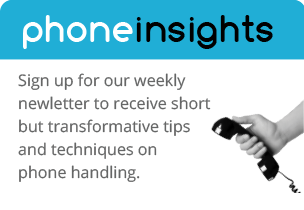 Clients commonly ask our opinion on the best phone scripts to use to improve call handling at their offices. While well-written scripts can be helpful, there are many experts that would advise against implementing them due to the fact they can lead to robotic and impersonal conversations. For us, the decision to script, or not to script, is not that cut and dry. In fact, we believe in a two-step approach where scripts are developed and utilized during the initial stages of training, but then taken away once phone handlers gain confidence in handling the various types of callers. You are looking for consistency in the way calls are handled so your customers know exactly what to expect when they contact your business. Your staff members are looking for guidance in what to say on the phones so they are more comfortable in achieving objectives. No one wants to be told what to do without being solicited for input. Phone handlers should have ‘skin in the game’ since it’s their personality, in combination with the right words, that will really deliver the best results. The last thing you want to do as the leader of your team is demand people read scripts they weren’t involved in developing. While you may think that’s the best way to control the customer experience, the overall result will be less than ideal since staff members will feel slighted in the process. Instead, get together with your team and explain what you are looking to achieve on each type of call– then let the team agree on the best scripting to achieve desired outcomes. Imagine how proud your crew will be in knowing they helped develop the scripts used by everyone in the office. You’ll be amazed at how enthusiastic staff members will be in reading the scripts (which is half the battle in making them effective!). Then, once your team has achieved a comfort-level with the scripts, it will be time to remove them all together. Why? Think of the scripts as the training wheels on your bike when you first learned to ride. They were attached so you could develop the muscle memory without fear you were going to crash. However, the minute you got confident enough to ride without them, you wanted them removed! That is exactly how scripts should be used. Let them guide your team members as they gain confidence in what to say for each type of call they will receive. But once they’re comfortable, take the scripts away so personalities shine! Always remember, it’s the emotional connection callers have that gets them booked for services (and telling others how great you are). So use the scripts initially to solidify your phone handling strategies, and then take them away to show team members you have faith in their ability to wow callers all on their own.